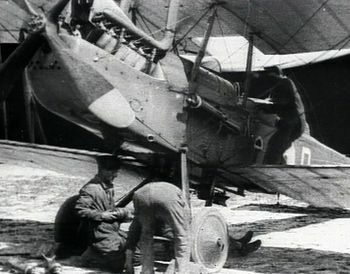 Royal Aircraft Factory B.E.2E seen in World War I . The Royal Aircraft Factory B.E.2 (Blériot Experimental) was a British single-engine two-seat biplane which was in service with the Royal Flying Corps (RFC) from 1912 until the end of World War I. The "Bleriot" in its designation refers to the fact that, like the Bleriot types it was of tractor configuration, with the propeller in front. About 3,500 were built. Initially used as front-line reconnaissance aircraft and light bombers, variants of the type were also used as night fighters. Like many warplanes since the B.E.2 was retained in front line service after it had become obsolete - finally serving as a trainer, communications aircraft and on anti-submarine coastal patrol duties.While the type was designed and tested at the Royal Aircraft Factory, the vast majority of production aircraft were built under contract by private companies, including well known manufacturers as well as firms that had not previously built aircraft. This page lists all films that feature the Royal Aircraft Factory B.E.2 . Royal Aircraft Factory B.E.2 on Wikipedia. Pages in category "Royal Aircraft Factory B.E.2"
This page was last modified on 12 November 2011, at 04:29.